People nowadays feed their puppies with almost everything. But with every new item on the menu, you are rightfully asking “is that is safe for my dog”. Today, the question is can dogs eat pumpkin seeds? Even more, dogs should eat pumpkin seeds, as they help your dog get a good night sleep, clear their intestinal tract of worms, prevent stone formations, and much more. With that in mind, we will look at the benefits of pumpkin seeds for dogs, how to feed your dog pumpkin seeds and a quick recipe for a treat. The nutritional value of pumpkin seeds is the same, no matter if you give them to your dog, or you consume them. Now that we answered the question can dogs eat pumpkin seeds, let’s take a look at all of the benefits they reap. As you can see above, pumpkin seeds are very high in fiber, which helps with digestion, both in dogs and humans. For our furry friends, pumpkin seeds are one of the best sources of fiber. Consuming them helps with constipation and diarrhea. You can even add a tablespoon or pureed pumpkin or melted pumpkin seeds to their regular meal to ensure regular bowel movement. Pumpkin seed also helps with indigestion or upset stomach. Being that anything is edible for some dogs, they can eat toys from time to time. Pumpkin seeds help them have regular digestion, despite eating anything they find. Pumpkin seeds are also high in essential fatty acids and antioxidants. This combination improves the urinary health of your puppy. In addition, they contain some vitamin A, which can reduce the likelihood of your pet developing cancer in his urinary tract. Another benefit of being rich in omega-3 fatty acids is that pumpkin seeds can alleviate inflammation. That makes the seeds crucial for fighting against conditions affecting aging dogs. Those include arthritis, hip dysplasia, and elbow dysplasia. As your puppy gets older, he might experience joint pain due to inflammation. Pumpkin seeds are a natural way to ensure pain-free life, even at an older age. Dogs love pumpkin, and if you want to help your puppy shed some pounds, look no further. Reduce the portion of their food, and replace it with the same amount of pureed pumpkin. They will feel just as full and get a healthier alternative. Of course, this is not something you want to do for a prolonged period. Dogs do need their protein, so feeding them just pumpkin will not work. 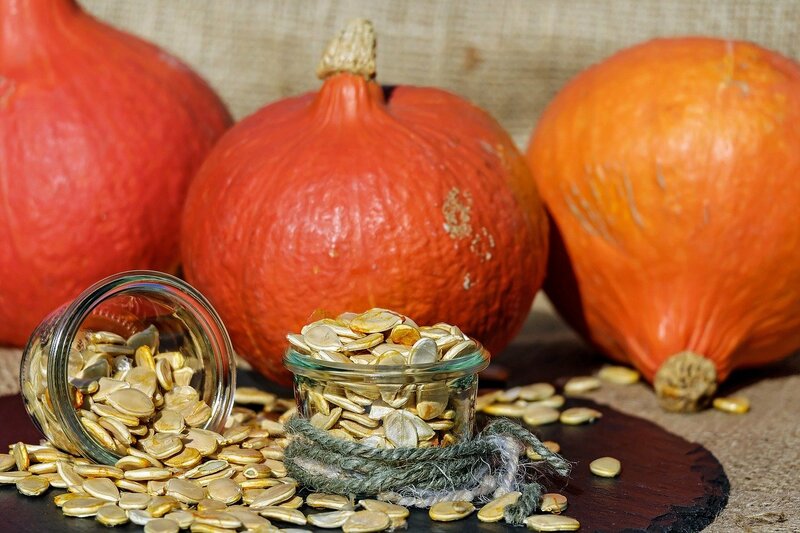 Raw and organic pumpkin seeds can be used to treat a variety of parasitic and other ailments. They have been used to treat parasites since the colonists first came to the New World and discovered the benefits of the Native American crop. Recently, herbalists have also discovered that these seeds can work as an effective deworming agent against tapeworms and other intestinal parasites in dogs. Pumpkin seeds have lipids, meaning they provide good fats for your dog and his body. Good fats are something humans crave for, but dogs as well. Our body needs fat to survive, and they better be of the good quality, not bad quality. Pumpkin seeds are rich in beneficial monounsaturated and polyunsaturated fats, responsible for lowering bad cholesterol in dogs and humans. What are the feeding directions for pumpkin seeds? We know that dogs can eat pumpkin seeds, but exactly how to feed them? Should you give them raw, cooked, or canned pumpkin seeds? With that in mind, let’s talk about the feeding directions. The good news is that pumpkin seeds can be fed whole as a treat to your dog. Just remember not to give him/her salted seeds from the grocery store. Both raw and cooked pumpkin seeds are safe for dogs. The only difference is raw seeds have a shorter shelf life. With that in mind, here is also one treat you can prepare for your dog. Pumpkin seeds are generally considered safe for dogs. There are no direct side effects of giving pumpkin seeds to your dogs. However, there are a couple of things you have to keep in mind. There are also a few things you have to avoid when feeding your dog with pumpkin seeds.